What do we mean by high rise buildings? Considering the high energy consumption of buildings, could high-rise buildings be sustainable at all? A high-rise or tall building is defined as one whose height is greater than 91 m, according to ASHRAE. Vertical Living and high-rise buildings have been designed in order to promote fast growth and urbanization in expanding cities worldwide. With a constantly increasing global population, 75% of whom will be living in urban areas by the turn of the next century, cities are growing rapidly, leading to unprecedented pressures on energy resources and materials. As a result, vertical living can be implemented as a means to alleviate such pressures. Tall buildings are growing more in demand due to the efficient use that they make of the limited land and space available. Providing high-density, efficient buildings for the urban-dweller may just be the optimal solution. However, the skeptic in us would question the extent to which high-rise buildings are sustainable. Let us then retrace the historic development of high-rise buildings. By the end of the nineteenth century, high-rise buildings had become possible as a result of technological advancements as well as improvements in buildings techniques. Steel and armed concrete in addition to the introduction of the elevator safety braking system in 1853 enabled the promotion of high-rise design. Despite the fact that the Netherlands is a densely populated country, it does not have real big cities. The biggest cities are Amsterdam and Rotterdam with both less than a million. The first European skyscraper, 42m high, was built in 1897 in Rotterdam. Yet, the high-rise record in the Netherlands continued to rise when the 64m tall GEB building was built in 1931 in Amsterdam. From 1986, quite a few high office buildings became part of the city’s skyline. With that, came increasing demand on resources and land. The National Spatial Planning Strategy in 2001 revealed that urban areas and infrastructure has grown dramatically, as land for forest and nature was diminished. Accordingly, a push for sustainable high-rise buildings, specifically high office buildings, came about in the Netherlands in the past few decades. But again, does their claim to sustainability hold ground when we assess the energy performance of these high-rise buildings? How do high-rise buildings fit into this discussion? Drew et al. (2014) conducted a study to evaluate the environmental performance of different types of houses (single family residences to supertall buildings), and deduced that high-rise buildings perform best overall. This also takes into account the operational as well as the potential carbon offsets on-site energy generation. 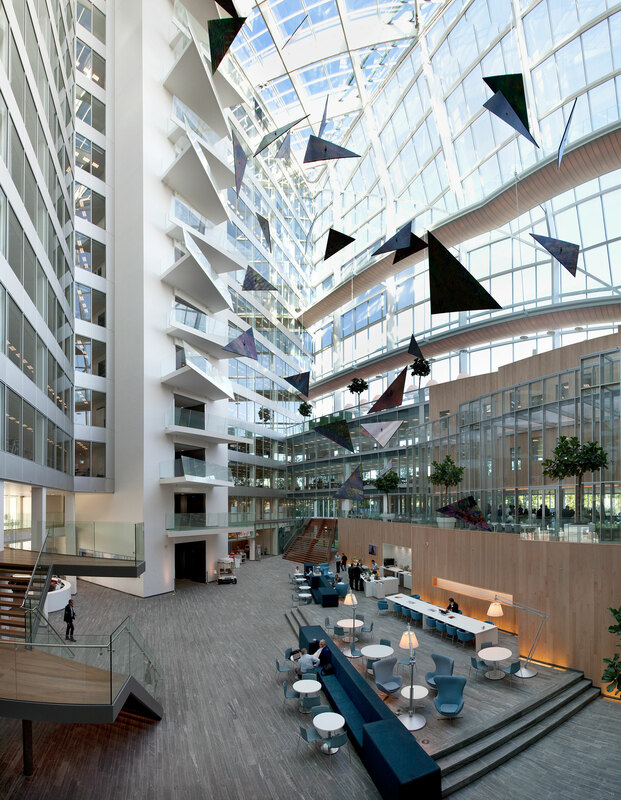 According to the British rating agency (BREEAM), the Edge in Amsterdam is the greenest building in the world with a sustainability score of 98.4%. The main concept behind the building’s astounding innovation is utilizing information technology in order to alter the workspace and atmosphere of work. Resource efficiency is evident, as its solar panels generate more electricity than the building actually consumes. Hailed as “the building of the future”, it stands out by using super-efficient LED panels, which can be powered by using the same cables that carry data for the Internet. These ‘digital ceilings’ also include motion, light, temperature, and infrared sensors. Natural ventilation was created in the building by placing mesh panels between each floor that let air spill into open space, and escape through the roof. Additionally, the building has the most efficient aquifer thermal energy storage in the world. It pumps warm water in the aquifer beneath the building, where it remains there until winter, and is then used again for heating. Rainwater is also collected to flush the building’s toilets and water the gardens. The Edge also serves as an ecological corridor for insects, birds, and bats throughout the city, as the north-facing terrace provides a continuous path of vegetation for such species. Imtech Green Building in Eindhoven is now considered one the greenest buildings in the Netherlands. It has been developed as a model green office. Sustainable materials, smart, energy-efficient technologies such as including innovative aquifer thermal energy storage (ATES) with mono-direction, using free-cooling and utilizing heat from the server room is used. 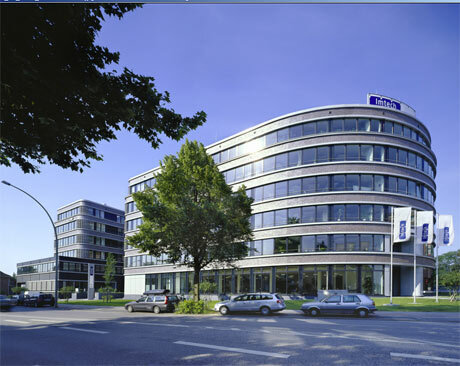 In addition, the building is based on using sustainable cradle-to-cradle materials and focus on energy efficiency. This is done by limiting thermal losses through insulation, heat resistant materials, and smart electricity consumption. The results is a 45% improvement in EPC (Energy Performance Coefficient) and 40% reduction in carbon dioxide emissions compared to a conventional new office, leading to a BREEAM score of almost 67% on the BREEAM-NL classification from the Dutch Green Building Council. Dubbed as the biggest building of the Netherland, De Rotterdam is worth a mention. The building includes apartments, hotel, entertainment facilities, and offices, founding the mixed-used towers of the vertical city concept. It is actually formed of small parts that form an exciting whole. As for the sustainability component, De Rotterdam partnered with an environmental organization, Eneco, in order to develop the 44 floors with under-floor heating and cooling that generates heat and cold through heat pumps. Big surface areas of exchanging energy within rooms enables high temperature cooling and low temperature heating. Heat reflective double-glazing windows allow fresh air inside, thereby reducing the cooling demand. Energy conservation and efficiency has recently emerged as an important criteria to high-rise design buildings. Since high-rise buildings consume a large amount of natural resources and energy, more attention should be paid to their energy performance and sustainability. Such sustainable designs, like the ones that are becoming more pronounced in the Netherlands, aim to meet the needs of the present without compromising the needs of future generations. This is done by the use of renewable resources, innovative strategies for energy production and conservation, environmentally friendly and intelligent design. Viva Green Homes is a listing portal exclusively for eco-homes, as it showcases eco & energy efficient features and 3rd party certifications, thereby providing a national platform for both professionals and costumers to find a full range of eco-professionals, real estate agents and services that targets their eco home buying needs. Although the focus in this article was on specific high-rise buildings in the Netherlands, these examples underlie that the emphasis should not be on the building per se, and the innovative smart technology it promotes, but rather the services and benefits it can offer the clientele and community at large. After all, sustainability entails balancing the needs of both the present and future communities.